Tamarind Mayfair is now open at 20 Queen Street, Mayfair, W1J 5PR, after a considerable eight-month rebuild, incorporating a whole new foyer and floor. 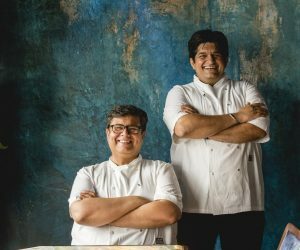 This esteemed Indian restaurant now has two incredible new chefs at the helm, Executive Group Head Chef, Karunesh Khanna and Tamarind Mayfair Head Chef, Manav Tuli, whose combined experience includes industry heavyweights Amaya and Chutney Mary. Together they have created a contemporary take on authentic Indian cooking, with examples such as Tandoori Prawn Balchao with spicy and tangy chilli marinade and Pistachio Crusted Grilled Lamb Chops just some of the utterly delicious dishes available. As for the interior, it really is breath-taking: both the lower ground floor and the first floor dining rooms are somehow intimate and magnificent at the same time, every beautiful detail – from the sumptuous fabrics to the bespoke floorboards – perfectly combines to create a fluid, serene, comfortable space incorporating 152 covers, over two impressive floors. Featuring an elegant pastel colour scheme, it is feminine and luxurious, without being overstated.